Gains ATK equal to its Level x 300. 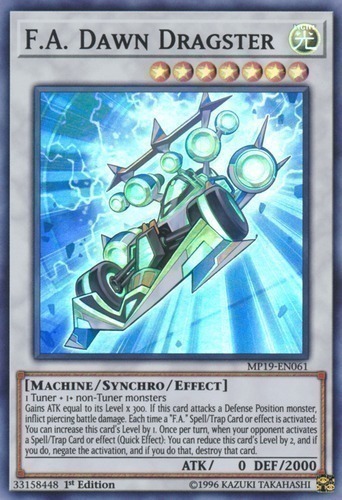 If this card attacks a Defense Position monster, inflict piercing battle damage. Each time a "F.A." Spell/Trap Card or effect is activated: You can increase this card's Level by 1. Once per turn, when your opponent activates a Spell/Trap Card or effect (Quick Effect): You can reduce this card's Level by 2, and if you do, negate the activation, and if you do that, destroy that card.